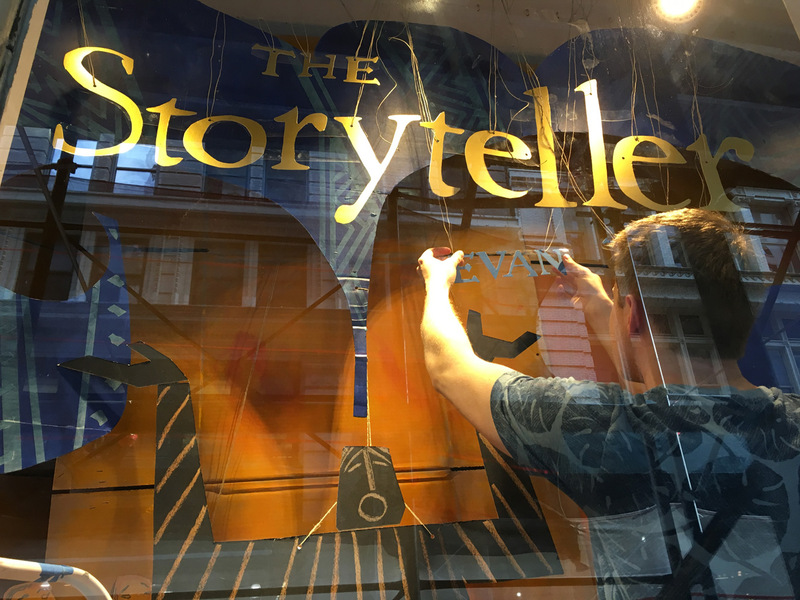 For the launch of The Storyteller, I had the honor of hosting my launch party at the wonderful Manhattan independent children’s bookstore Books of Wonder, and to create a window display for their storefront. 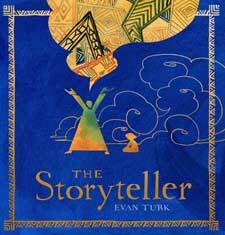 Julie Danielson at “7 Impossible Things Before Breakfast” interviewed The Storyteller creator Evan Turk about the creation of The Storyteller, upcoming projects, making a picture book, and much more! Take a look to see sketches, thumbnails, and even some ceramics! It is in this sere, story-famished Morocco that a thirsty young boy receives, from a stranger, a brass cup. If he can find water, the cup will allow him to share. 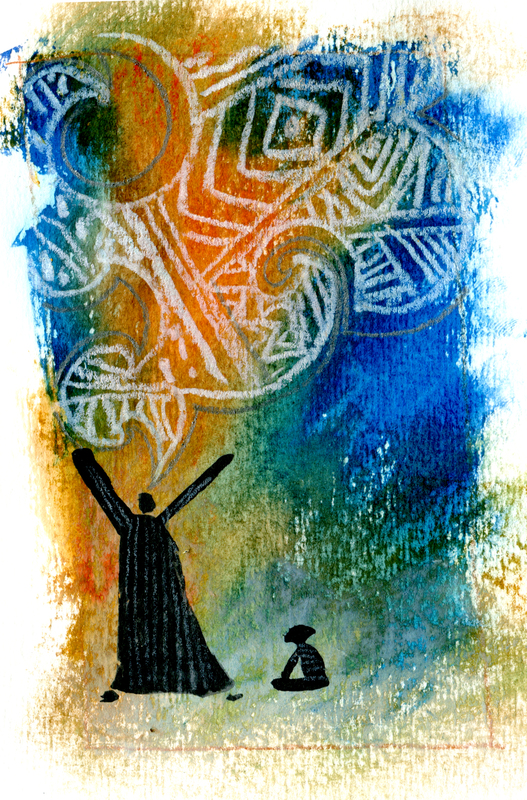 Soon the boy encounters a withered old man, who spins a tale of drought and treachery and whose words, to the boy’s amazement, leave his cup brimming with water. Over the next days, the man unfurls more stories, each connected to the first, each a wellspring of fresh water. 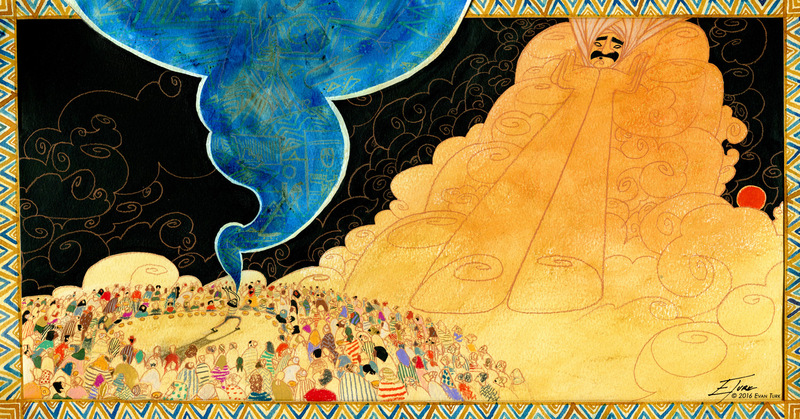 So when a fierce jinni in the form of a sandstorm arrives to menace the city, the boy and the storyteller know what to do: Like Scheherazade, they forestall destruction by telling stories to the jinni. Mr. Turk’s illustrations lend a strange beauty to this tale-within-a-tale-within-a-tale. Publisher’s Weekly’s “Children’s Bookshelf” recently did a feature photo essay on the creation of ‘The Storyteller’! 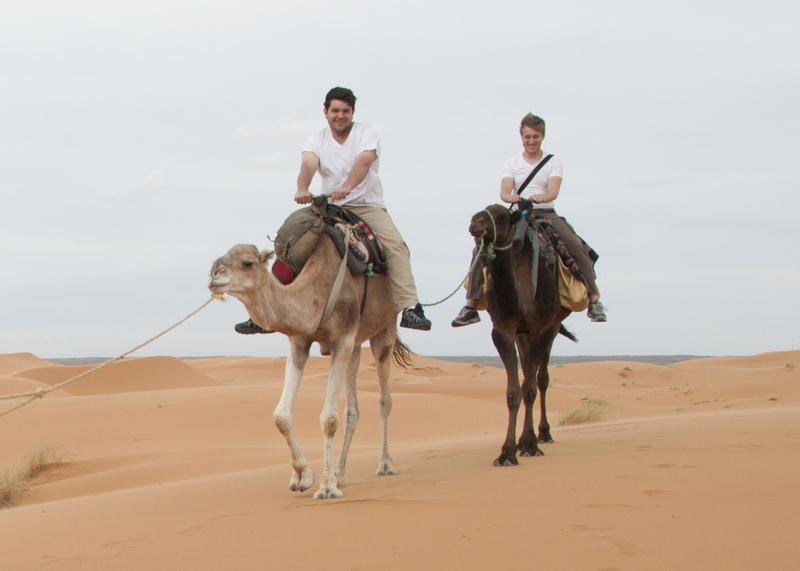 I talked with them about the inspiration, my trips to Morocco, where I learned some of the techniques, and how the story began! Thank you so much to Natasha Gilmore at PW for reaching out. The Storyteller Launch Party at Books of Wonder! The old Moroccan saying that Turk shares with readers, “When a storyteller dies, a library burns,” perfectly captures the message of his picture book: stories are life. In drought-stricken Morocco, at the edge of the Sahara desert, a thirsty child’s quest for water leads him to a fountain, where an old, forgotten storyteller sits. He captures the boy’s imagination with a tale, and by the time the man has finished speaking, the boy’s cup has miraculously filled with cool water. Day after day, the boy returns to the fountain, eager to hear more of the story. Meanwhile, a djinn draws near the parched kingdom, threatening to turn it back into desert. The boy—in a Shahrazad-like move—distracts (and defeats!) the djinn by sharing the storyteller’s tales, which simultaneously rejuvenates the city by bringing its people together and replenishing the kingdom’s wells.